Luxury Condo Living in Fabulous Mariemont! General Information: Built in 2008, Jordan Park has been a successful residential development. One measure of success is the lovely Tudor Revival architecture which blends seamlessly with the tone and tenor of the Village of Mariemont - a National Historic Landmark. Another measure of success is measured by the fact that all units were sold upon completion. The community consists of 2 and 3 bedroom residences. Residents enjoy living in an excellent expression of the vision of Mariemont's founder; Mary Emery. The neighborhood was designed as a walking space with plenty of trees, open spaces and an idyllic town square where neighbors can meet for lunch, dinner, shopping or a movie. We've been involved with this development since it's inception. In fact, we represented the owner of the land that Jordan Park Condos were built upon! We can provide the broadest perspective to your research. If you are interested in being put on an 'Alert List' to be informed when a residence becomes available for sale, contact Lee, Stacy or Elizabeth. If it comes to pass that you consider selling your residence, please call Lee, Stacy, or Elizabeth. Each will provide a very high degree of expertise for your successful sale. These agents bring the added marketing reach of the only true international realty company in Greater Cincinnati. Our marketing ability is enhanced by our connection to a network of over 21,000 agents in over 900 offices in 70 countries. We do share referrals. 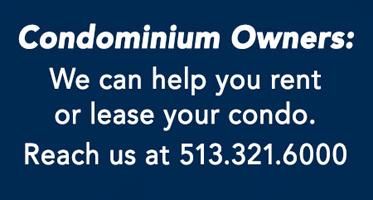 If you're interested in leasing your home, our sister company, CincyRents will manage that for you! Buying, Selling or Leasing, we've got you covered!